Bacillus spp. based larvides are increasingly replacing, with numerous advantages, chemical insecticides in programmes for controlling black fly and mosquito populations. Brazil was among the pioneers in adopting Bacillus thuringiensis israelensis (B.t.i) to control black flies. However, the major current mosquito control programme in Brazil, the Programme for Eradication of Aedes aegypti launched in 1997, only recently decided to replace temephos by B.t.i based larvicides, in the State of Rio de Janeiro. 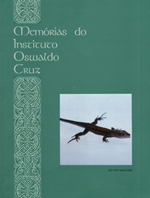 In the last decade, works developed by research groups in Brazilian institutions have generated a significant contribution to this subject through the isolation of B. sphaericus new strains, the development of new products and the implementation of field trials of Bacillus efficacy against mosquito species under different environmental conditions.